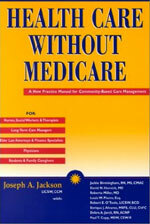 Joseph A. Jackson, LICSW offers the most comprehensive guide to community-based care planning and care management. An important new practice manual for health care professionals, social workers and long-term care advisors. In Health Care Without Medicare, Joseph A. Jackson describes the essential knowledge and skills of ElderCare Planning (ECP). Jackson’s ECP model offers a new method of practice for community-based care planning and care management for frail-elderly, disabled, and chronically-ill individuals. A student of the health care and long-term care systems, Jackson combines the viewpoints of all the members in the lifecare team − including health care, finance, estate planning, and counseling professionals − to teach a new approach to caring for consumers of the greatest portion of high-tech, institution-based health care. Spelled out in this book, his unique approach holds great promise for the future of long-term care and health care for everyone − patients, their families and professional caregivers and advisors alike − all working together to manage our growing caregiving crisis. You may download a sample of Health Care Without Medicare. These documents are in Adobe Acrobat PDF format. If you do not have Adobe Acrobat go to the Adobe Corporation to download a free copy of the Acobat PDF reader. Joseph A. Jackson, LICSW is author of Health Care Without Medicare: A New Practice Manual for Community-Based Care Management and Staying Home, Staying Well: A Home Care Planning Guide. He is CEO of The HomeCare Planner, a social enterprise company dedicated to enhancing community based care for those in need, and President of ElderCare Advisors, Inc., a care planning and care management company serving western New England and eastern New York. Mr. Jackson lectures nationally on the topics of health care reform, geriatric care management, and developing community-care alternatives for frail elders, the physically disabled and the chronically ill. He is a Licensed Independent Clinical Social Worker, a member of the National Association of Social Workers and the National Association of Professional Geriatric Care Managers. On January 16, 1999 the author hosted a day-long retreat at his home in Lenox, Massachusetts. His invited guests included two physicians, two nurses, two social workers, a lawyer, and a financial planner − each leaders in their respective fields. The contributors presented their ideas on what a well-trained care manager should know about each of their domains of practice. Their presentations, along with afternoon case discussion, became a template for the book. The author embellished their ideas and combined many of his own to produce this work. Thus, this book is a team effort, not unlike the ElderCare Planning itself − born of the same consensus and disagreement that takes place every day in the national effort to plan and manage the care for our elderly, our chronically ill and our physically disabled citizens. You may choose to mail your order with payment by check or money order. Order online with Mastercard, VISA, or American Express. Fax in your order with credit card number and signature.